Each month, we feature a professor from the Faculty who supports and contributes to feminist legal thought. BS: Tell us where you started? What was your first job? HMK: My very first job ever actually happened to be law related, even before I had ever thought of law. It was updating a looseleaf business law book that I helped my dad work on. I made a lot of money doing a really boring thing. When I was 14 or 15, I was a foot messenger at a big law firm in downtown Toronto, before email and faxing. We would run between buildings and get signatures. It was good exercise and I really got to know the downtown core. My first real law job was clerking for the Chief Justice for the Federal Court of Appeal. It was probably my favourite job ever, other than my current job. BS: What was your path to law? HMK: Ever since I was a little kid all I wanted to do was be a teacher and so many people tried to talk me out of it. When it came time, I applied to both teacher’s college and law school. I got into law school so I went there. I loved it right from the beginning. Even the subjects I didn’t love, I liked the idea of somebody giving me a question and finding an answer. I kind of felt like a detective. Even tax policy was interesting to me. There are so many social justice issues in so many aspects of law and I find that very fun and interesting. I took environmental law in my JD, and then when I was clerking at the Federal Court I applied to Environment Canada. I worked there for 18 months and I loved it. Then I did my masters and PhD, which were both focused on environmental law. BS: Did you know you were interested in the academic side of law then or did that happen later? HMK: Being a law professor was my path to teaching. I thought it would be fantastic to be a professor because I could do all of the research work and the policy work while teaching at the same time. The year after I did my masters, I was living in England. I called the University of Sheffield and I ended up TA’ing four small groups on Friday afternoons. I looked forward to it every week. This was my first opportunity with teaching. BS: How did that interest develop? HMK: I always loved learning so much. I loved school. So I wanted to remain in the educational environment all the time. In teaching there is always a learning experience. You learn from trying to explain things, you realize gaps in your own knowledge, you’re always learning something new. BS: What are you working on right now that you’re particularly excited about? HMK: The big new thing happening over the last few years is the focus on food law. Food law has grown relatively recently and is just starting here in Canada. At uOttawa, we want to be part of this growth. My own interest in food law started because I work in environmental law, and I saw how often food law issues affected the climate. It’s talked about more often now, the circular relationships between food production and consumption, and how that affects carbon production. Climate change also makes it difficult to grow sufficient quantities of food. I noticed I was writing a lot about food law while doing environmental law. Along with Nathalie Chalifour, I started to look at food law in relation to farming. Now I am working with Professor Chalifour and our PhD student, Angela Lee, on editing the first food law textbook in Canada. We also hosted the second annual food law conference in Ottawa last year. Angela and I also co-taught a food law course for the first time last winter. It had an environmental element and a justice element, but also covered intellectual property (trademark, copyright) and torts, for things like food fraud and class actions for bad food. Food law also involves a lot of administrative law on how regulation and enforcement of food rules and food safety happen. We also talked about cutting-edge technologies in food. In the text, we talk about food and the particular implications for women and Indigenous peoples. We want to make sure there is gender-based analysis of food law policy to see how women are affected here and internationally. For example, Professor Bita Amani from Queens University talks about the corporatization of breastfeeding through the promotion and sale of breast milk and alternatives, among many other feminist food issues. On Indigenous issues, there is growing awareness about issues of food sovereignty and challenges with Indigenous food security in both urban and rural areas. From the outrageous price of food in Northern communities, to access to fresh fruit and vegetables, there is great need for Canadian food policy to be aware of these social issues. It’s also about learning from Indigenous food systems and what this traditional knowledge could contribute to sustainable and just food policy in the rest of Canada. It’s a good time to be working on these issues because the federal government is working on a national food policy, which we’ve never had. We’ve been attending consultations and trying to ensure that the current revisions to the Canada Food Guide incorporate sustainability issues. In terms of opportunities for students, we’ve met a lot of practitioners who are doing this kind of work but wouldn’t call themselves food lawyers. This is changing, and young lawyers with expertise in food law are needed, so we have a new Food Law Students Association at uOttawa, which is only one of a handful in Canada. BS: What is the best thing about being a professor at uOttawa? HMK: The students of course! You are always meeting new people with new ideas so it helps you stay current. It’s so rewarding to watch students learn, and to learn from them. I still learn new things form a torts course I’ve taught 13 times because of the students’ questions. I think our students in particular are very diverse and engaged. We’re so lucky with our faculty here; our colleagues are all extremely smart and diverse and friendly. They’re very outgoing and mutually engaged. We collaborate a lot and learn from each other and it is a very positive environment. We have so many specializations in technology and international law and feminism, but all of us seem to come together around the social justice mission. 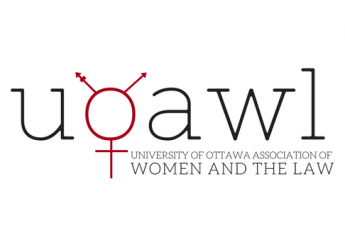 Everyone seems to be united on this key theme that uOttawa is known for. I also love the bilingualism aspect and being able to use both languages every day, as well as the dual perspective of common and civil law. BS: One of your primary research areas is in ecofeminism – tell me more about that. HMK: That’s a really interesting combination of feminism and ecological approaches to law. It comes from the radical feminist approach. Feminist legal analysis tries to look at underlying structures and causes of why women are discriminated against or disproportionately affected by laws and policies, and ecofeminism asks whether the same structures lead us to exploit the environment. Things like overemphasis on technology, industrialization, competition, cost benefit analysis – a lot of these structures that exploit women are the same ones that cause a lot of environmental degradation. The heart of it goes deeper than just ‘how does environmental law affect women differently’, although that is important too. We touch on it a bit in the food law course. BS: What about your free time? Can you tell us your favourite book or movie? HMK: One of my favourite books is kind of on the environmental theme but is easy reading. It’s called “Priceless: On Knowing the Price of Everything and the Value of Nothing.” It’s really interesting. It takes case studies of how we put value in some things and not in others. It’s very engaging and a page-turner, even though it’s a non-fiction book. BS: What else are you interested in outside of law? HMK: I love hockey. I have two boys who play hockey at a competitive level. I’ve never attempted playing but I should since I spend so much time watching it! I also love traveling and music. I’m learning to play guitar and I have always played piano. We always have music on at home and we’re always going to performances. I like folk music a lot. One of my newest discoveries is a musician from Sarnia named Donovan Woods. I love Cat Stevens, and Simon and Garfunkel. I also try to listen to Spanish music as well. And of course lots of Canadian music like Joni Mitchell, Jann Arden, Bruce Cockburn and of course our Lynda Collins. I got to see Burt Cummings recently from the Guess Who and he really sounds almost as good as he always did. I love languages, I’m always trying to learn new languages. I studied Russian for ten years and speak a little bit of Spanish. I’m getting better. Right now I’m working on my Gaelic, as my husband is Irish. BS: If you had one piece of advice for law students what would it be? HMK: It’s important to make sure you get the legal education that you want. Sometimes it’s easy and there are lots of courses in the area that you love. But if it’s not, there are so many opportunities for SPIs and directed research, or to take a course in a different department. Don’t let application forms and rules stand in your way. You should follow your own path and your own dream in law. Don’t listen to talk about what jobs you should take and what courses you should take. If you do what you love you’ll be happy doing it and that’s what you’ll be good at. There’s so many areas people don’t think exist because they don’t see them. There are not just the traditional eight or ten categories to choose from. The other thing I always tell students is that if there are ever opportunities to combine things you want to do, do it. If you want to travel and get legal experience, go abroad for that experience. Look for ways of achieving several goals at the same time.